As you get older, age-related vision problems can make driving more difficult. In some cases, driving may even be dangerous. You may find that you need to alter the way in which you drive to compensate. Is your Age Affecting your Driving? Try to avoid roads that you know will have lots of traffic. If you're becoming more nervous when driving, busy roads tend to make this worse, so avoiding them can help to counteract this. You may need to plan your journey in advance to do this, particularly if you will be travelling through areas that you're not familiar with. The same goes for driving after dark, especially if your eyesight is getting weaker. As well as being unnerving, it can also be dangerous (both for you and for other road users). Don't get behind the wheel if you're taking medication. This applies to drivers of any age, but it's particularly dangerous if you're lacking in energy in the first place. If you feel particularly nervous or uncomfortable whilst driving, a refresher course can bring your driving skills up-to-date. This is especially beneficial if it's been a long time since you took your driving test. If your hand-eye co-ordination isn't as sharp as it used to be, you might want to make a few adjustments to your car to make things easier. You can have adaptations fitted in your car to help you with mobility problems. See our article on 'Having a Car Adapted To Suit Your Needs' for more information on this. Legally, all drivers need to be able to read a stationary number plate from 20.5 metres away. If this requires you to wear glasses or contact lenses, you're legally obliged to wear these whenever you drive. If vision problems start to affect your driving, you need to contact the Driver and Vehicle Licensing Association (DVLA). Regular eye tests will pick up on changes in your vision, which may not be particularly obvious to you, especially if the changes are slow but steady. Eye tests will also detect the development of conditions such as glaucoma and cataracts, which make can make driving extremely dangerous in the advanced stages. You also need to report other medical conditions that may affect your driving. The DVLA will then assess whether it's safe for you to continue driving. If you carry on driving past the age of seventy, you'll need to get your driving license renewed. Drivers aged over seventy need to get their license renewed every three years. If you drive for a living, the renewal rules are slightly different. You need to renew your license at forty-five. After this, you need to renew every five years until you're sixty-five, after which you must renew every year. 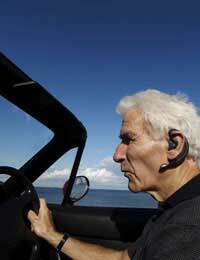 Eventually, age-related problems may make it impossible for you to continue driving in a safe manner. This is an individual responsibility, and common sense should be used when coming to a decision. For expert advice, try talking to your GP or a trained driving instructor. You can also arrange to attend an experienced driver assessment carried out by the Royal Society for the Prevention of Accidents (RoSPA).